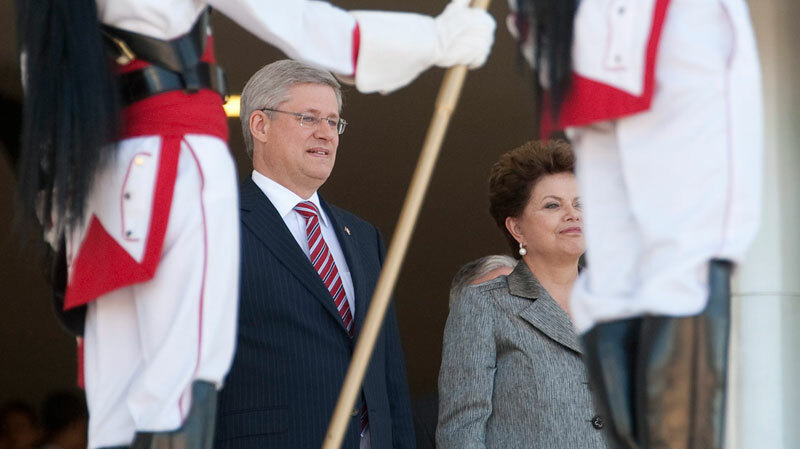 On the evening of August 7th, 2011, Canadian Prime Minister Stephen Harper landed in Brazil, South America’s economic powerhouse, to meet with President Dilma Rouseff in hopes of fostering an improved trade relationship between the two significant middle-rank nations. The meeting between Harper and Rouseff took place Monday August 8th, officially launching Harper’s six-day Latin American tour. Harper also has plans to visit Colombia, Costa Rica and Honduras later this week. To commemorate the Canada-Colombia free-trade agreement, which will go into effect next week, Prime Minister Harper will meet with President Juan Manuel Santos on Wednesday. Colombia has a similar FTA agreement pending with the United States, and has expressed hopes for eventual ratification of the agreement by the U.S. Congress, citing it as instrumental in continuing to strengthen its trade relationship with North America. Prime Minister Harper is expected to close his Latin American tour in Central America with visits to both Costa Rica, on Thursday August 11th, and Honduras, on Friday August 12th. The Prime Minister’s visit to Honduras will make him the first foreign leader to visit the Central American country after its readmission into the Organization of American States in June. Harper is expected to stress the promotion of trade and investments, as well as the reinforcement of democratic governance and the advancement of common security, as part of his Central American agenda. Costa Rica, Canada’s largest trading partner in Central America, already has a free trade agreement with Canada, which went into effect in 2002. To finalize his tour, Harper will visit Honduras. Canada has significant business interests in that country, especially in its ever-controversial mining industry. Prime Minister Harper’s meeting, which will largely focus on trade matters, will be of particular importance to several interest groups in the poor Central American nation, especially since one of the main Canadian mining companies in Honduras, Goldcorp, Inc., has been at the center of much controversy. In addition to charges of poisoning streams and rivers with arsenic and mercury, the Canadian company has also been accused of the depletion of water resources in the country. Goldcorp’s many other health and environmental transgressions tied to its open-pit mining operations in the Siria Valley, and its non-responsiveness to members of the local community, have made it one of the desecrated foes of many environmental groups and indigenous communities in the region. Prime Minister Harper, who, after a previous Latin American tour in 2007announced his Government’s strategy to better engage the Americas, will have much to prove in Parliament after his visits. The original “Canada’s Engagement in the Americas” plan, dating back to 2007, focused on democratic governance, economic prosperity and security. The free trade agreements have certainly tried to meet some of Canada’s promises towards Latin America. However, consistent controversy surrounding Canadian companies’ mining practices, and other trade disputes, are likely to challenge the quality and quantity of Harper’s commitment should he, after these official visits, also remain unresponsive. Harper’s roads to reconciliation with Latin America will have many curves in it. Canada’s prestige as the good North American nation has dramatically faded in recent years. 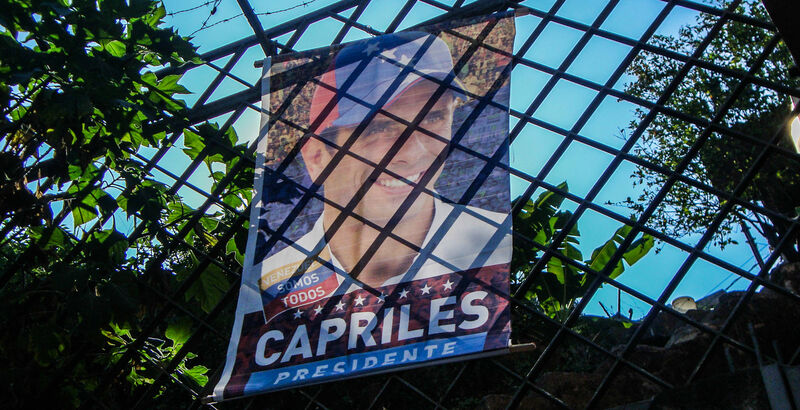 Washington’s deceitful support of the status quo in Honduras was the hallmark of the White House’s policy towards that nation during the last Bush administration. The Canadian Foreign Minister will have to do a lot of explaining to justify Ottawa’s callow emulation of U.S. policy.